You Are Here: Home > 2018 Jeep Grand Cherokee – Colorado Springs CO.
2018 Jeep Grand Cherokee – Colorado Springs CO.
Jeep has off-roading experience in its blood. Ever since the introduction of the Wrangler and Cherokee, it has been the number one choice for people looking to take their driving off of the boring roads and into nature where life is less hectic and stressful. Since the company knows how to build a platform that can survive the harsh punishment of a variety of changing terrains, it should be no surprise that Jeep has infused the 2018 Jeep Grand Cherokee with this same pedigree. What might be a surprise, however, is the fact that the Grand Cherokee is still a reliable and comfortable on-road performer as well. While many SUVs are capable of existing off-road, most do so out of “necessity” than anything else. The Grand Cherokee, on the other hand, offers a true balance between on and off the road, to the point that occupants can enjoy the comforts of the stylized interior even while the vehicle drives through rocks and mud. The 2018 Jeep Grand Cherokee has plenty of performance and features to offer anyone looking for a larger luxury SUV. Starting at $30,595, the SUV offers respectable specs such as a 295-707 horsepower range depending on the chosen engine, 11-19 city MPG, and 17-26 highway MPG fuel economy. 2018 also introduced several new interior features to the platform such as an updated infotainment system with greater connectivity. Jeep has a habit of giving customers more than they would expect out of an off-roading monster of a vehicle. This is particularly true with the interior where the creature comforts often rival the offerings of smaller cars and SUVs. In the case of the Grand Cherokee, the interior blends a number of high-tech features, advanced safety systems, and an overall feel of durability with comfort for everyone in the cabin. For passive safety features, the Grand Cherokee has an array of standard airbags that surrounds the entire cabin for all of the occupants. In the front, both the driver and passenger are protected by front and side airbags that come out of the dashboard, side seat, and cabin wall. The rear passengers are also protected by a side airbag to minimize damage during a rollover or side impact. Most of the active safety features come as optional packages and additions on top of the standard offerings of each trim. The Jeep Active Safety package, for example, comes with a full-speed active cruise control with forward-collision warning, blind spot monitoring, lane-departure warning and lane-keeping assist, and parking sensors with automatic assisting features for parallel and perpendicular parking. The infotainment system is a standout addition of the Grand Cherokee since it offers more standard features than other vehicles in its class. Connectivity and safety are enhanced with standard Apple CarPlay and Android Auto integration which both offer a hands-free driving experience. Mobile connectivity via 4G LTE and mobile wifi are optional along with a typical navigation system. The Jeep Grand Cherokee is a bulky vehicle. There is no polite way to put it: this SUV has mass. Given its affinity for being on and off of the road, this bulk is actually a good thing. Driving this SUV will leave you feeling safe and confident knowing the vehicle will manage a variety of road conditions. The overall design of the Grand Cherokee mimics the styling of many popular SUVs on the road today. A hefty front holds the customer’s engine of choice and the SUV’s signature headlights and grille design. The slightly swept interior has plenty of head and legroom with space for up to five individuals. Best of all, the chassis sits high, offering a lot of ground clearance for when the off-road experience comes calling. Jeep takes a rather unique approach with the Grand Cherokee by offering nine different trims so customers can find something they like. Each trim comes with slightly different cosmetic touches and accents, but most offer the same 3.6L V6 and baseline package of eatures. Notable trims to check out are the new 2018 Sterling Edition which comes with chrome accents around the grill, front, and roof rails, and the off-road oriented Trailhawk. Jeep designed the Grand Cherokee knowing that its customers will want to put the SUV to the test in terms of off-roading capability. When you are a company that excels with smaller vehicles like the Wrangler, it is only natural to extend these design influences to a larger SUV as well. With that in mind, the Grand Cherokee has a range of engine options that promise a lot of power and torque to move the SUV up rocks, hills, and streets alike. The baseline 3.6 V6 engine is a good powerplant that comes on the base models of the SUV line. Optimized for better fuel efficiency, this engine still manages to offer a respectable maximum of 295 horsepower under the hood. With 260 pound-feet of torque, the engine does a great job of propelling the SUV’s massive frame in a variety of average driving conditions. When more engine power is required, the Premium Unleaded 6.4L V8 is the proper choice for greater performance and torque. The engine outputs a maximum of 475 horsepower which puts it in a position to rival many of the engines found in trucks. The maximum torque rating is around 470 pound-feet which is more than enough to pull the SUV’s frame or even do some trailering should the need arise. For some reason, Jeep decided not to stop with the 6.4L V8 engine for its power offerings. Deep under the hood of the Trailhawk trimline sits a monster Supercharger Premium Unleaded 6.2L V8 that sounds like it was ripped right from a heavy-duty pickup. With an astounding 707 horsepower and 645 pound-feet of torque, there is virtually no substitute for the power this engine has to offer. Jeep has a unique twist on the common drivetrain options normally offered by its competitors. In addition to the expected all-wheel drive, the company bucks the trend of providing a standard forward wheel drivetrain and favors a rear wheel design instead. This design can improve traction off road without the benefit of a 4×4 drivetrain since the vehicle’s weight helps push the wheels down into the ground. 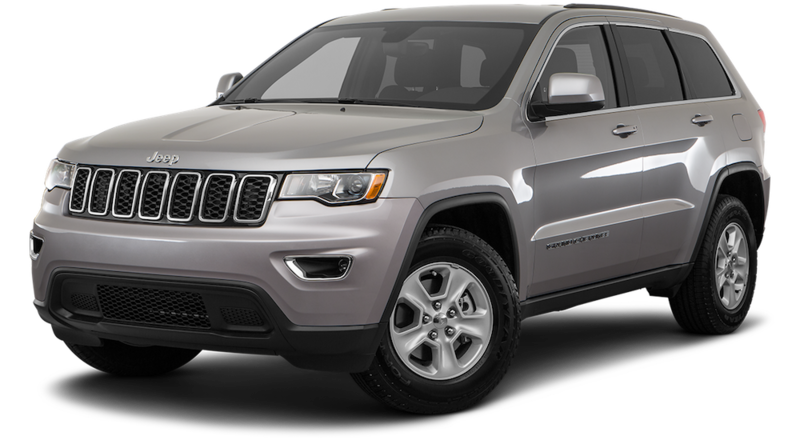 Interested in the 2018 Jeep Grand Cherokee in Colorado Springs, Colorado? Colorado is full of so much off-roading potential that it is almost a crime not to have a vehicle capable of conquering this unique terrain. If you want an SUV that is right at home in this terrain, the Faricy Boys have you covered. Our Jeep inventory is unrivaled. From the Cherokee, Grand Cherokee, to the Wrangler, our selection represents the best Jeep has to offer. More importantly, we can tailor each model to your exact tastes with a plethora of trims and additional options. Balance off-roading performance and capability with safety and convenience features that make driving one of these SUVs enjoyable. In fact, you just might forget you are driving an SUV in the first place. Whether you have a large family to tow around or just want to conquer the outdoors, Faricy is the first and only place you need to check out to satisfy your SUV needs.